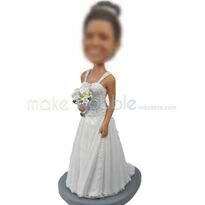 Custom Bride bobbleheads - a love more than a gift! In the same way as the groom's friends support him as Best Man and ushers, the bridesmaids and matrons of honor support the bride. Why not commemorate this day for them from our range of bridesmaid's Bobbleheads? This gift will be a wonderful reminder of this happy day.